Sportingbet sportsbook gives you a fantastic opportunity to enjoy the favourite sports and win good money at once. Its impressive selection of sports and betting options will surprise you. 20 languages and 12 currencies make the betting process with this sportsbook convenient for millions of sports lovers. 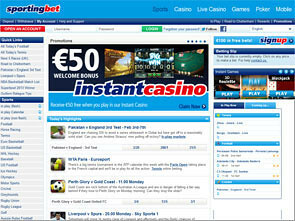 The popular eGaming contest named Sportingbet the sportsbook of the year in 2007. You will find whatever you like at Sportingbet: football, horse racing, tennis, basketball, hockey, baseball, ice hockey, motor sports, cricket, greyhounds, rugby, golf, boxing, snooker, cycling, volleyball, etc. Also, you can bet on Olympics, poker tournament winners and even on politics. Find the full choice of betting options at their official page. 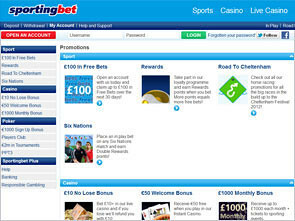 Many online sportsbooks offer you interesting promotions, and Sportingbet is not an exception. New players can get 100% up to $100 Free Bets. To win this sum you need to register a new account, deposit at least $10, and make first four bets. The first sum you stake will be matched an extra bet of up to $10. Next three bets give you up to $30 matches. Also Sportingbet suggests you to accumulate points and get a Reward Bonus. Bonus points are awarded depending on how much you stake. To count the points you get, simply multiply the stake size by the number of sections in your bet. You can exchange the minimum of 100 points. Follow the most actual sport events with Sportingbet, and you will get even more bonuses. The site refreshes the list of bonus offers all the time, and suggests you to win trips to major sport events, or some free bets for a certain kind of sports. Just visit their official site regularly, and check the Promotions section. It’s not hard to make your first bets with Sportingbet. For this you first need to register a new account. Just fill in a brief form with your full name, address, birthdate and other miscellaneous information. After that, you can make your first deposit, get the free bets bonus, and start betting on your favourite sports. 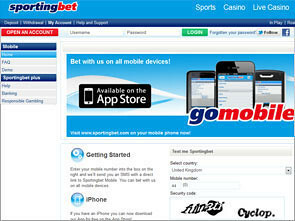 At Sportingbet you can also use the mobile version of their site. It allows you to keep track of all major sport events wherever you are. The supported platforms are Android and iPhone. 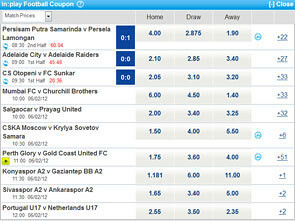 You can enjoy the same range of sport markets and the same odds at Sportingbet Mobile. Choose the platform of your mobile device: iPhone, Android. Fill in your mobile number and the captcha security code. Download the app using the link you receive in an SMS. Run the installed app, seposit and make your first bets. Sportingbet has round 15 years of experience. For this period they understood, what their bettors like most, and now suggest you to deposit using Visa, Mastercard, Maestro, WebMoney, Moneybookers/Skrill, NETELLER, Click2Pay, and several other popular banking systems. To withdraw use Visa, WebMoney, Moneybookers/Skrill, Click2Pay. These systems give you fast deposits and reliable transfers. The deposits at Sportingbet vary between $10 and $10,000. The minimum withdrawal using their banking systems is $15. In case some problems appear, or you decide to clear out some details, contact the friendly helpdesk of Sportingbet using Live Chat, teamsa@sportingbet.com, or the international phone number: +353 16297331. Don’t forget to check the FAQ page before turning for help.